I decided to try my luck at installing XP on the thing – after all, I don't use it any more, and I might as well prove a point to the 20 or so people who have told me that XP would never install or on something that old. And if it didn't work... oh well, I didn't really need the laptop anyway. The system did not have a floppy drive, thus I had to do the installation from within Windows 98. I popped the XP CD-ROM into the external CD-ROM drive and began setup. The first problem I ran into was XP's check for installed RAM. XP Setup complained about there not being enough (it required 64MB of RAM and I had only 40). So I used the old txtsetup.sif trick: I copied txtsetup.sif and dosnet.inf from the XP CD into an empty folder (c:\xpsetup), edited the RequiredMemory and MinimumMemory lines, respectively, to specify 33554432 bytes (32MB) of RAM as minimum, and manually started setup by running winnt32.exe /m:c:\xpsetup. After XP Setup had installed the boot loader and copied the Windows files to my hard drive, I rebooted, but could not continue setup due to the lack of available hard disk space (I needed 1371MB free). So I entered DOS mode and began to deltree like crazy (being careful not to delete anything related to XP setup). I rebooted and began the install. To my surprise, it worked. It took a good 6 hours to install, but the installation eventually completed and I was in Windows. Windows detected all of the hardware in my ancient laptop without any issue whatsoever. Interestingly, after spending all of that effort deleting files to free up every last byte of space, there was a good 950MB of free space left on the hard drive. Obviously, Windows XP doesn't exactly run well on a ThinkPad 560 with these specs. It takes around 4-5 minutes to boot. It runs better than I expected, however; without any programs open, XP is actually a bit more responsive than 98. Nice website. Thanks for your posting on the 560. I'm very impressed. I recently purchased an old 560 off ebay. It runs Windows 98SE. I decided to try and upgrade it to Windows 2000. I keep running into a similar problem. It tells me I need more disk space (800mb+). I've been deleting old programs and files but I'm not sure what not to delete. I especially don't want to delete anything that runs the Thinkpad features. Any suggestions of what I should or shouldn't delete? How about doing a fresh install instead of an upgrade? Do you think its risky? Thanks again. What I ended up doing s far as deleting files: I started Windows XP setup from within Windows 98 and chose to do a clean install. 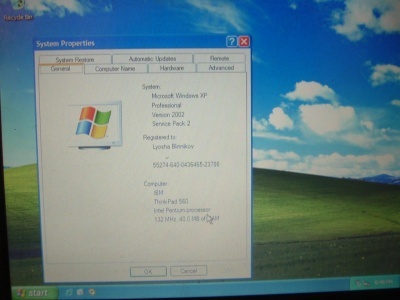 This copied the Windows XP setup files into two directories and installed the boot loader (ntldr). 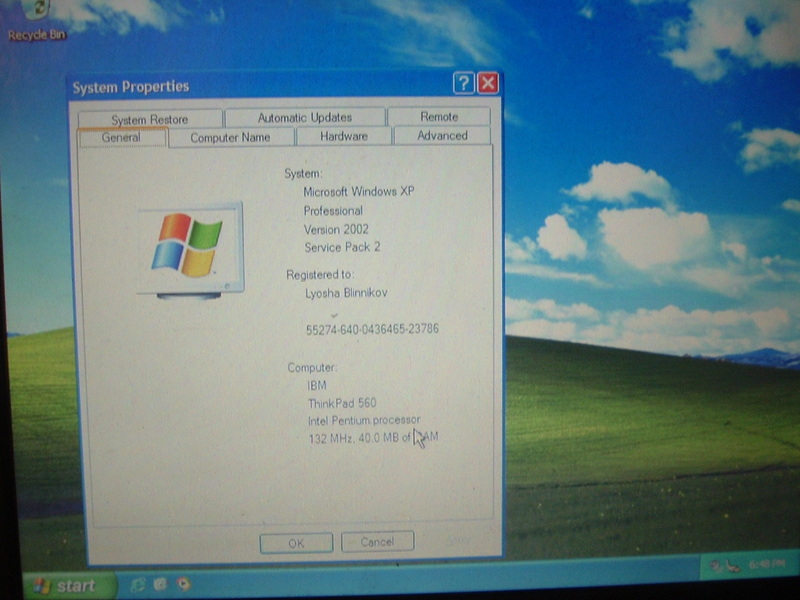 After ntldr was installed, the ntldr boot menu had two entries: "Windows XP Setup" and "Microsoft Windows". The "Microsoft Windows" option started Windows 98. I chose "Microsoft Windows" and pressed F8 immediately afterwards, then chose "Safe Mode Command Prompt Only". Then, I ran "deltree" on everything but the two Windows XP setup folders (basically, you're safe deleting "Program Files", "My Documents", and "Windows", as well as pagefile.sys and pm_hiber.bin). Then, reboot and choose "Windows XP Setup". If you happen to have a floppy drive with that Thinkpad, there is no need to go through this ordeal -- simply boot with a diskette that contains drivers for your CD-ROM drive and run d:\i386\winnt.exe and it should start Windows XP (or 2000) setup. if you're doing it from DOS. If you're doing it from Windows, don't use an MS-DOS prompt window -- use the Run dialog.